Well, we were in Texas a mere 4 days. Not a lot of time to gather a very sophisticated impression of the place or the people. Still, because I was there to collect my award medallion of excellence from NISOD, the National Institute for Organizational and Staff Development, we got to meet people from all over the United States and parts of Canada. Over 1200 people received awards and over 2000 attended the conference that was held in conjunction with the Awards Ceremonies. To a large extent, all the people we met in the conference rooms, breakout sessions, exhibition hall, out on the streets and in the restaurants, basically wherever we went, the people were no different than what one might find walking the streets of Vancouver. Most people are polite, honest, mind their own business and keep to themselves. Like people everywhere they are absorbed in their daily lives, trying to make a living or leave a trace on this planet by doing something worthwhile and significant. All want to be heroes to some extent, recognized by their fellow human beings, looked up to if possible, but at least not denigrated and diminished. We met a young man, a waiter in a restaurant, who we engaged in conversation. He was not only a waiter, but a concert musician and new music writer. He beamed when we acknowledged the value of his endeavours and wished him luck while promising to visit his website. On our last day there, we stopped for coffee at the Café Crêpe, a small coffee shop attached to our hotel. I realized that this was a French themed establishment, but I was surprised a little to find out that the owner spoke impeccable French. He told me in French that he had arrived in Austin when he was 22 years old, decades earlier, and had stayed to work and make a life although he returned to France 3 to 4 times a year until 9/11 when he reduced his travel because of new travel restrictions. Another young man we met in a thrift shop upon learning that we were Canadians (I tell most people we meet, it’s a great ice breaker.) told us that although he lived his whole life in Austin, he always wanted to move to Quebec City. He asked us what we knew about Quebec Cite and if we thought moving there would be a good idea. Of course, we said. It’s a cliché, but everyone has a story, or many stories. Everyone wants their story or stories to mean something. If there’s a universal human characteristic, that’s it. If there’s a point to the NISOD Awards Ceremony, that’s it. Of course, that’s not all I learned in Texas. Aside from any commentary I might make on people I met in Austin, I was struck by the construction of condominium towers going up in the downtown area. Whole neighbourhoods are being bulldozed, making way for new construction. I was told that there will be 25,000 more people living in the downtown core of Austin in 5 years than there are now. It’s a city growing at a two-digit rate. Given the state of the American economy, Austin has to be an exception. The freeway and highway systems are extensive and traffic moves well, to a large extent. We took a tour outside of downtown one day and I was impressed by the number of over and underpasses, but I also thought about how much it would cost to maintain them. I heard more than once how high taxes were in Texas. It’s amazing how seldom people actually make a correlation between the services they receive from the state and the amount of tax they pay. Somehow, they think that they should not have to pay any taxes while still enjoying all the benefits they take for granted every day of their lives that are provided by the state. People are strange. That’s another thing I learned in Texas. I learned a lot more in Texas, of course and I’ll get around to writing more about it soon. If you have any questions about my time there, leave a commentary. Ask away. So, an award was bestowed upon me. I will be attending the NISOD conference (http://www.nisod.org/conference/) to receive an Excellence award. I was chosen along with four other members of North Island College’s staff and faculty for this distinguished award. I first thought of it as a teaching award, but it’s for more than my classroom activity. I’ve been very active over the years in community organizations and in community-based research. I also sat on the college board for seven years, chaired my department for several years, was part of the dean’s advisory committee and I spent some time on the Education Management Committee (when it existed). Wherever you looked, I was there. Frankly, I wasn’t always welcome where I was. I was also the first president of the NIC faculty association. It was very tense when we organized in the early 90s, and the president at that time was eventually gracious in accepting our presence on campus. Still, there was no shortage of controversy. One thing that always rankled the administration was the fact that there was a faculty member on the Board. It was a source of constant conflict as the administration and community members of the board insisted that I was always in conflict of interest. Nasty things were said, the tension was palpable at times, but I survived. And now I’m retiring. I am honoured to receive this award. It means some recognition for the work I’ve put into my classroom, online and interactive television teaching over the past 30 odd years as well as for my other activities at the college and in the community. I know it’s a bit of a cliché to say so, but many other faculty members at NIC are deserving of this award. There are some excellent young teachers at the college who should be in line for this award. As I said, I am honoured to receive this award, but it would be nice if younger faculty members got the award and were able to attend the annual conference in Austin, Texas. They could then share some of their new-found knowledge with other members of the college community. There should be an award for old farts like me, but more like the one they give out at the Oscars for lifelong contribution to filmmaking. So, we’re off to Texas. I’ll try to get a blog post out while I’m there, maybe a commentary on the city and the conference. Why not? Does Class Matter in Canada? A script I wrote in 1993 for a Knowledge Network telecourse. There are various ways that we can think about the question: Does Class Matter in Canada. Because the question arises in the context of the conflict perspective in sociology, I want to address it from that perspective, but from a classical conflict perspective as well as from a more contemporary perspective. 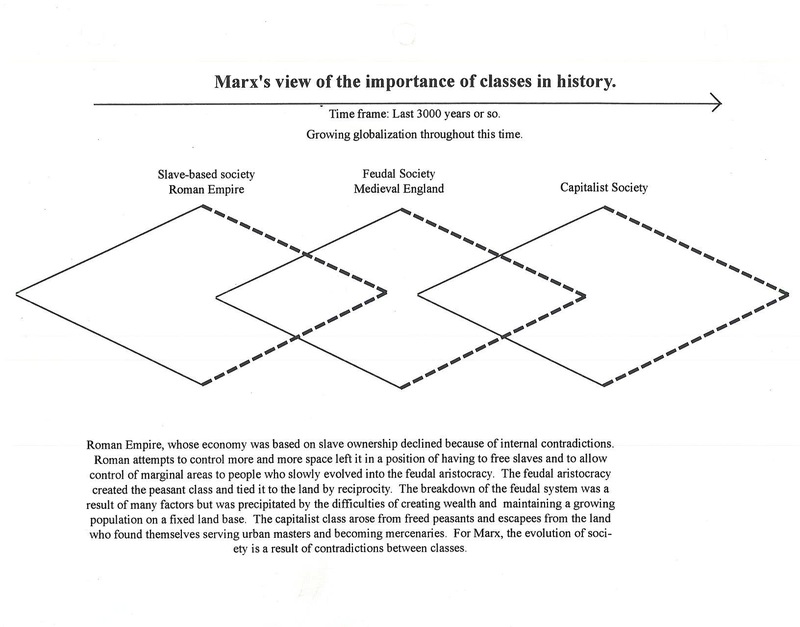 From the classical conflict perspective in sociology, the question relates to the genesis of capitalism. That is, to what extent class analysis can explain the course of history. There is a contemporary conflict perspective on the question too, but it focusses on inequalities in society and life chances. The question “Does Class Matter” arises partly because, in the popular mind, history is created mostly by politicians and political and military decisions. That’s what gets into the history books. Class, by any definition, doesn’t enter into the picture. But there’s more to it than that. In an article called “Does Class Matter,?” Wallace Clement of Carleton University notes that class analysis is currently under attack for being too narrowly focussed and for not bringing ethnicity, region and gender sufficiently into sociological and historical analysis. I agree with Clement when he concludes that these factors are important, but that fact alone doesn’t lessen the importance of class. And it’s necessary to point out, I think, that class doesn’t refer only to the “economic” relationship between the working class and the capitalist class, it refers to the entire spectrum of relations in society that are the experience of living in class society. Class does kind of hit you square between the eyes, though, in a situation like the one surrounding closure of the Cassiar mine in northern British Columbia in February, 1992 In this case, the “company,” a subsidiary of the Princeton Mining Corporation of Vancouver, decided to close the mine for various reasons. The effect of this closure, whatever the reasons, was the dislocation of 400 workers and their families, who were required to move out of their community, the company-owned town of Cassiar. The place was then put up for auction. The mine owners had every right to close down the mine and, in a sense, miners have to expect that mines must eventually shut down. The decision on the part of the mine owners, nevertheless, demonstrates clearly the absolute power that the capitalist class has in disposing of the working class as it sees fit without regard for community, democratic process or anything else. There’s no question of who’s in control here. Same goes for mill shutdowns in Port Alberni and in single-industry towns all over the province. Just ask the people of Sparwood how they were affected by the bankruptcy and shutdown of a Westar mine there. The clear demonstrations of power by the capitalist class in these circumstances are not so clear in others, especially with regard to the experience of everyday life in capitalist society. Many contemporary conflict theorists have focused on class inequality and its effects in everyday life. Here, the overwhelming “collective consciousness” or ethos of capitalist life more often than not masks its class-based origins and sometimes, as with racism, family violence or education, there seems to be no connection whatsoever with class. We have the illusion of living in a relatively classless society. There’s a very significant fragmentation and stratification of the working class in our society. There’s very little chance of moving from one class into another in our society if we think in terms of a ruling class and a working class. Hope burns eternal in most of us, however, of “getting ahead,” or of doing just a little bit better than the Joneses…even if we’re all on welfare. Even at this level, however, there is really not as much mobility as you might think and we hold our relative positions in the class structure remarkably consistently from generation to generation. The reason is that once a particular group gains an advantage in the class structure, it will do whatever it has to to maintain, strenghten and transfer that advantage to the next generation. When sociologists talk about life chances in capitalist society, they refer to the ability or potential to live a happy, healthy and economically secure life…to quality of life. It’s pretty obvious that there are different qualities of life, that there are major differences in the life chances of a single mother on welfare and those of a college president. Conventional wisdom and liberal ideology don’t recognize the existence of social class, so inequality between a single mother on welfare and a college president is always seen as the result of personal characteristics. The burden is always on the individual. You occupy your place in society because of intelligence, or lack of it, willingness to work, thrift, courage, etc… By this analysis, those of you who have poorly-paid jobs, who are unemployed, underemployed, or on welfare, with low levels of schooling and no money are that way because you’re stupid, aren’t willing to work hard enough, or you’re wimps, or all three. You may even believe that yourselves. If you’ve bought the dominant ideology in our society, you probably do go along with this “cream rises to the top” business. The problem is that persistent inequality in our society is not explainable with reference to personal characteristics alone although they may play a role in some cases. In our society there are gradations of statuses on the basis of income, occupation and education. Sociologists often refer to these gradations as strata or classes. These should not be confused with the classical conflict definition of class, which refers only to your relationship to the means of production. It’s not quite as simple as this, but if you score high on all three characteristics, good job, high education and lots of money you are considered upper class. Score low and you’re lower class. It’s only too obvious we’re not all equal in terms of condition, but what about opportunity? We have equal opportunity don’t we? If we work hard, we can get ahead, can’t we? Sorry to disappoint you. If you were born female to native parents in Masset on the Queen Charlotte Islands what do you think your chances would be of being appointed to the Board of Directors of Noranda, or General Motors, or the Bank of Montreal? Would your chances be any better if you were born male to a single mother in Burnaby? What about if you were born male or female to the president of a major corporation living on the waterfront in West Vancouver, in Point Grey or Shaughnessy? What all of these questions address is the relationship between social stratification, social mobility and life chances, but at the individual level. Stratification goes much beyond the individual level. It is a social fact. What we have a hard time accepting is that we are somehow locked into a particular strata or class. Is there social mobility? Let’s look at the way most of us think of as the best way to get ahead: education. Is there a class bias in access to higher education in B.C.? Is a post-secondary education accessible to all and does it lead to social mobility and a better life? In a paper called Education Under Seige: Financing and Accessibility in B.C. Universities, published in 1985 but still very much relevant today, Neil Guppy of UBC concludes that there has been no democritization of access to university. He reports, based on a study he conducted that vocational institutes and community colleges cater to working class or lower middle class students while universities continue to cater to upper and upper middle class students. And the reality is that a university education still produces greater material rewards so unequal access to university tends to reinforce social inequality. For most of us, most of the time, class, defined both in classical and contemporary terms, has an enormous influence on our life chances. There you have it. On Class: A script for the Knowledge Network Sociology Series. Boy, that guy sure has class! Have you ever heard that before? Or maybe you’ve heard: she doesn’t have much money, but she’s sure got class! Well, what do we mean by class in this context? We can’t just say “well, you know what I mean”…because this is a sociology course and sociologists don’t say “well, you know what I mean.” Sociologist need more than that. As sociologists we can’t assume that other people know what we mean, or that we share their meanings with them. So what DO we mean by class here? I think that we’re communicating a whole lot of things when we talk about class like this. although I think that we’re mostly unconscious of the content of this kind of communication and its symbolic significance. We can tell a bit about what’s important to us, and what we value by paying attention to the hidden messages in our conversations. Implicit in the notion of class as I just used it in my examples is the fact that in our society people have different incomes, occupations and educational levels and those who have lots of income, prestigious occupations and lots of education are better than people who don’t . They can afford to dress expensively, drive new luxury cars, eat in “classy” restaurants. We admire them, wish we were like them and see them as being successful. People who are less wealthy but who have discriminating tastes and try to emulate the people who have more are given thumbs up for giving it a good shot. It also happens, of course, that we run across the comment: boy, that guy’s loaded, but he’s got no class at all! In this case, we have expectations of what rich people do, how they behave, you know, swavely, and we are disappointed when an obviously wealthy person doesn’t live up to our stereotypes and expectations. Thorstein Veblen, an American economic historian and social philosopher who died in 1929 wrote a book called The Theory of the Leisure Class. In this book he explains that we can relate to people just above and just below us on the social scale. We are scared as hell of dropping down a notch and we’d sure like to catch up to the Joneses. As regular people we can’t relate to people whose lives are so different from ours, that is, members of the leisure class, that class of very wealthy people who don’t need to work, at least not in the way most of us think of work. They tinker with their stocks and bonds, or hire other people to even do that. They invest. They don’t collect wages or a salary. They are the David Rockefellers of the world. But let’s get back to basics. Class, what is it? Is it simply an attitude, a set of behaviours that we see as cool, calm and collected? Well, class is different things to different people. There’s a major difference in the way a structural functionalist or liberal sociologist and a conflict theorist or Marxist conceive of class. And their conceptions have little in common with the common view of class in the sense of “classy” restaurant. I’ve got a dictionary of sociology that defines class as a totality of persons having one or more common characteristics. Class, according to the dictionary, may or may not signify the existence of a hierarchical scale of social power. There are age, nativity, occupational, industrial, social, ideo-politico-economic, and income classes says the dictionary, but races and nationalities don’t qualify as classes although they divide the population. In the “m” section of the same dictionary, we find the definition of middle class. It says here that the concept of middle class used to really mean something in the 19th century, but that now most of us think of ourselves as middle class: intellectual workers with moderate incomes, skilled artisans, prosperous farmers, white collar workers and salaried employees of large mercantile and financial establishments. According to the dictionary, they have few common economic interests and whatever unity they possess lies in their standard of living and ideals of family life, their mores and recreational interests. Well, this dictionary was first published in 1941 and it isn’t politically correct anymore (although my copy was printed in 1970). The dictionary definition of class is basically a liberal definition whereby class is defined in subjective terms, by the way people think of themselves and describe themselves. Not all sociologists are happy with that definition, however, and some think that the word class is too ambiguous or ideologically charged to be much good to use in a scientific study of society. They want to be able to measure class objectively, recognizing that people don’t all have the same standard of living. In doing so, they borrow a term from geology, stratification, which describes how the earth’s crust gets layered over millions of years via sedimentation and other processes. Sociologically, the term refers exclusively to one’s relationship with the market…at the level of consumption. If I can buy more than you, I’m higher class. Class in this sense is separated from what is considered a person’s political and social status. All three phases of life, class, status and political power constitute the context of the distribution of power in society. This way of thinking also fits with the ideas that in our society, politics, business. education, law. etc., are all separate and independent spheres of activity and power in one is totally unrelated to power in another. From this perspective, class can be measured objectively and people can be ranked on the basis of income, occupation and education. A conflict theorist or Marxist would say that the concept of stratification is fine but it doesn’t explain much. Sure, some people are rich and some aren’t, but just because a person is wealthy doesn’t mean that that person is powerful. Win a lottery and get rich, sure, but do you have power? Depends on what you mean by power. If we think that the ability to purchase things is power then we might think of the wealthy as powerful, no matter what the source of their wealth. If we believe this, we are basically subscribing to a liberal view of the world. The conflict theorist looks for the source of power elsewhere, at least initially…in the production and reproduction of wealth and ownership of the tools to recreate wealth…that is the factories, mines, mills, etc.. From this perspective, the basic class division is between the owners of the means of production (mines, mills, etc) and those who work for the owners of the means of production and who are dependent on them for their livelihoods. And the issue here is not relative individual power, Bill Gates versus you and I, but in the role that the owning and working classes play historically in the evolution of capitalism. In this way of thinking, the affluent worker, who may hang out at the club and work in the highest offices in the highest sky scrappers downtown, is relatively wealthy, maybe, but is still dependent on the owning class. And the determining factor for class analysis is not the worker’s affluence or poverty, but his or her dependence. From a structural conflict perspective, its not the fact that there is social inequality based on relative wealth that’s important, but the problem of access to the opportunities to get that wealth. That’s the difference between equality of condition and equality of opportunity, but that’s a topic for another day. There’s never been, nor is there, a communist country on the planet today. As I wrote in a previous post, the capitalist mode of production is the more ‘important’ institution, much more important than countries, the one that drives the evolution of all other institutions, at least in their general character. So, for 400 years or so now, capital accumulation in the form of commodity trade, distribution and consumption has driven human economic production. It took some time before the capitalist mode of production displaced the feudal one, but with time and lots of bloodshed the deed was done. By the mid-19th century when there was so much profound intellectual activity generated by the change in mode of production, the British manufacturing class controlled parliament and pursued its goals on a global scale. But these weren’t quiet times. The working class was being created at a blinding pace and wasn’t too happy with its lot. Eventually laws were passed like the 10 hour day law that protected to some extent the working class. Pressure was brought to bear on government, which at the time was dominated by the manufacturing class. Workers were thereby putting pressure on their own employers who also sat in the House of Commons (in Britain). They were also contemplating alternatives to the capitalist mode of production. They came up with communism, communalism, the co-operative movement and others. The fight was now on for the hearts and minds of the average worker. In the early part of his career Karl Marx (1818-1883) was front and centre in the fight against capitalist exploitation of the working class. Later in his career, while writing Capital, he settled down to study scientifically the historical replacement of dominant modes of production as I note in a previous post. He stated in the Introduction to Capital, Volume I that what he was trying to do was apply to political economy the same method applied by Darwin in The Origin of the Species. In other words he was using an evolutionary framework of analysis. Technology was huge in his analysis and for that he’s been called a technological determinist. Technological development certainly plays a role in Marx’s analysis but his work is always dialectical and I don’t detect any reductionism or determinism anywhere in it. For Marx, then, slave-based modes of production (Ancient Rome) were replaced by the feudal mode of production, which was in turn replaced by the capitalist mode of production which will be replaced by the communist mode of production but only when all the productive forces of the capitalist mode of production are exhausted. This means that when labour is replaced by capital (automation, etc.) to a point where the possibility of exploiting the working class no longer exists because the working class no longer exists as a major force in human production, then communism happens. That transition may hurt, but transitions often do. Marx, then, sees an evolution of dominant productive forces with communism yet to come. So, what happened to produce this legacy of (Manichean) stupidity that says that there are different political systems that countries can adopt, like on a menu? Countries can be either capitalist or communist or somewhere in between. But it’s plain to note that from this perspective, countries are doing the choosing here. Plainly enough, some countries came to be dominated by ‘communist’ governments (e.g., The Soviet Union, China, North Korea, etc.) while others were part of the ‘free’ world (Britain, France, Canada, the US, etc.). However, the ‘communist’ countries were never ‘communist’ and the ‘capitalist’ countries preferred to refer to themselves as democratic, free countries. Of course they were self-professed supporters of the ‘free enterprise’ system, but within a supposed democratic political form where the people ruled. Not! So, the ‘communist’ countries were pretty much totalitarian, but communist they weren’t. Still, they liked to say they were to contrast themselves to the ‘evil’ capitalist countries of the ‘West.’ And of course, the ‘West’ was only too happy to exploit the lies Stalin and the like were telling about themselves. Everybody became ‘an evil empire’ for someone else. Brilliant. It’s a great way to keep people at home in line: “We need to stick together in the face of the threat from the evil empire (take your pick depending on what side you’re on)! Now, it’s becoming increasingly difficult for the remaining ‘communist’ countries like China to maintain the charade that they are in fact ‘communist.’ China (the country) is now merely a tool of capitalist production as is every other government on the planet and all of them are rapidly becoming redundant in the face of the still rising dominance of global finance capital. Canada now has a government that wants to do away with itself in the worst way. It’s there to do the bidding of its capitalist masters and Stephen Harper and his cronies seem to revel in the role they are playing on the global capitalist push for complete dominance. So far, we’re just along for the ride. But like in the 19th century, workers will rebel in any number of ways. They will be unsuccessful, though, in any attempt at getting control of human productive forces until the time is right, and we’re not there yet. Lies, lies, everywhere…what can we believe?